Data mining is a procedure of analysing data using a number of analytical tools. The Analysis is done by finding correlations and patterns in large databases where one event is associated with the other. With the help of Data mining software, entire raw data is turned into a valuable information asset by discovering the relationships between different events of data which helps in making feasible predictions about the future. This is one of the very efficient data mining software that implements most advanced analytics techniques to deliver predictive models to businesses. It provides a fine platform to rationalize unprocessed data and convey it as a product packed with useful information which aids in making knowledge based decisions for business processes. 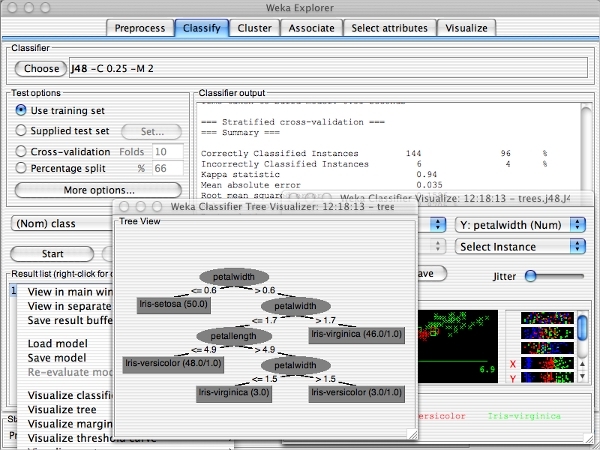 This is a fine machine learning software. It has been written in Java and hence is compatible with most of the operating systems. It basically operates on a set of machine learning algorithms to scrutinize and interpret large relational data bases and deliver prospective results for future. This is one of the most reliable data mining software that analyses the databases with modern analytical techniques and obtains the most significant information out of them. It has successfully replaced the data scientist and provides accurate predictive model by extracting the hidden patterns from voluminous databases. 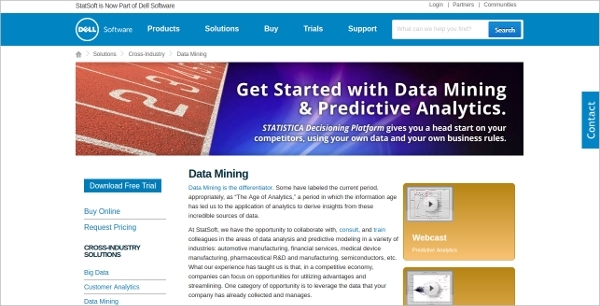 This is one of the most comprehensive data mining software available in the market. It possesses all the required tools needed for complete data mining process. From building a structured information base to delivering precise predictive models, this software allows organisations to make proficient decisions for the future. 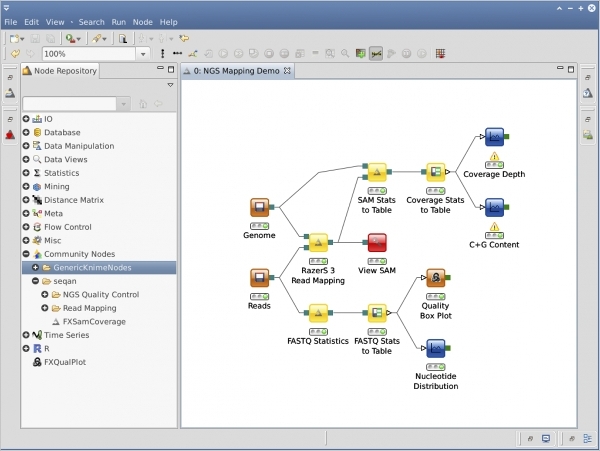 Orange is a very popular data mining software known for its user friendly system of tools. One of its tools that distinguishes it from others is its data visualisation through bar charts, scatter plots, dendrograms, heat maps etc which makes the analysis of data very convenient, for evaluating future trends. 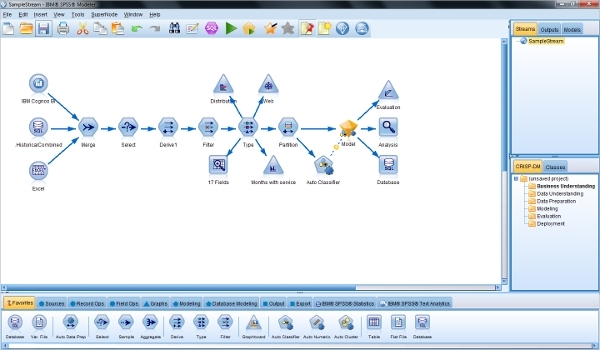 Rattle data mining software is one of the most advanced software which uses Graphical User Interface technology for data mining purposes. 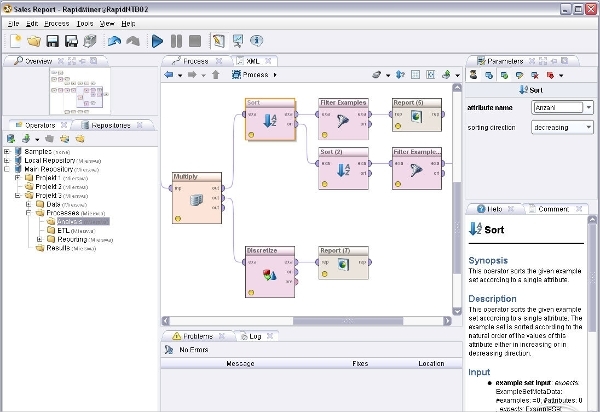 It basically relies on model base techniques presenting data in a statistical or visual manner after the extraction of the patterns and important information from large databases. The process of analysing and obtaining the patterns as well as relationships from a lot of databases and turning them into efficient and effective information packages is said to be data mining. Few years ago it was done by data scientists thus trying to give business organisations a competitive edge in the market. However, in today’s time, they have been completely replaced by data mining software that uses a much more efficient and advanced technology and analytical techniques breaking down complex databases and deciphering the insights from them to help the business organisations stay ahead from its competitors by providing them the future trends. Today, it has become an integral part of many businesses since it is able to transform a raw data into business intelligence which is further utilised by the business institutions for decision-making purposes and as well as to make a practical forecast for the future market conditions. How to Install a Data Mining Software? The installation procedure varies from one operating system to another like Windows, Mac or Android as every operating system has its own configuration. The installer file should be compatible with it, only then it can be installed properly. The installer file is available to be downloaded from publisher’ website. One should go through the installation manual properly before downloading and installing the file, and follow the instructions for each and every step as directed in the manual. It becomes very easy to comprehend the procedure if one goes through the instruction manual thoroughly and can install the file quite comfortably. Data mining software are consistently becoming more and more popular in business world due to its amazing analytical and insightful capabilities to turn a conglomerate of data into a refined and useful knowledge pack making it a valuable asset for a business establishment. The main feature of a data mining software is that it disintegrates large voluminous data in a systematic manner to bring the relevant information out of it. This extracted information aids the organisations to make plausible predictions about the expected future market trends. Subsequently, they can keep themselves prepared and make the best out of any situation, whether it would be adverse or favourable for it. The other most beneficial part of having a data mining software is that it reduces the workload and simultaneously saves a lot of time and as money for a firm. The organisation need not hire any outside data scientist and depend on him to analyse databases, which not only adds to the cost of the company but also consumes a lot of time where as the software accurately analyses big databases giving a more accurate result. 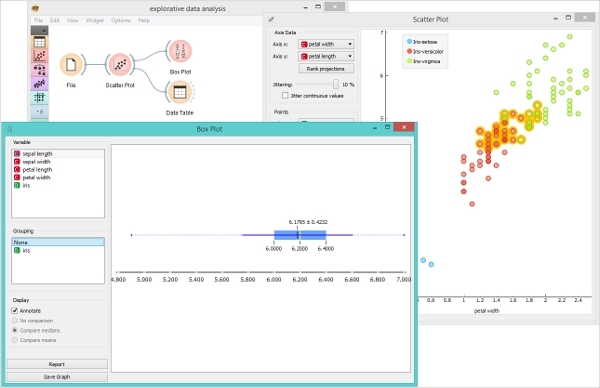 KNIME is an all-inclusive, open source, user friendly data mining software. It uses graphical user interface that allows analysis of data through excavation and transformation of patterns and raw information from already present large data bases into precise and business oriented pack of information. 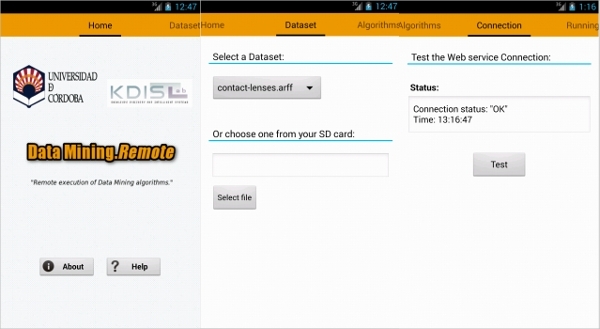 This is a data mining software which has been specially designed for android platform. It uses algorithm machine learning technology for data mining. It analyses the data bases and devises analytical representation of data to produce reliable results that aids in making sensible prediction for future. 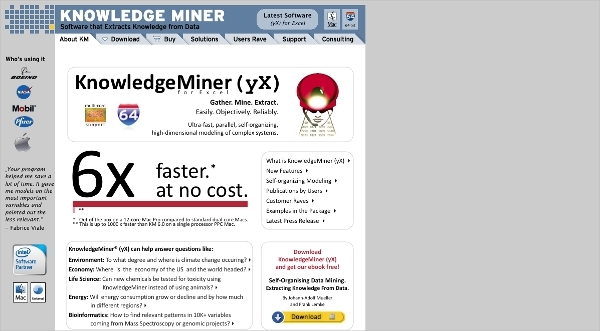 Knowledgeminer is one of the best data mining software that has been designed particularly for MAC platform. Its fundamentally based on self organizing modelling which obtains unprocessed information from the provided data to construct a model and eventually transform it into an efficient knowledge bundle which will serve the business purposes particularly in decision making. For windows version “Apache Mahout”, “ML-Flex”, “Databionic ESOM Tools”, “NLTK”, “ELKI”, “Sentic Net API” are some of the popular software. 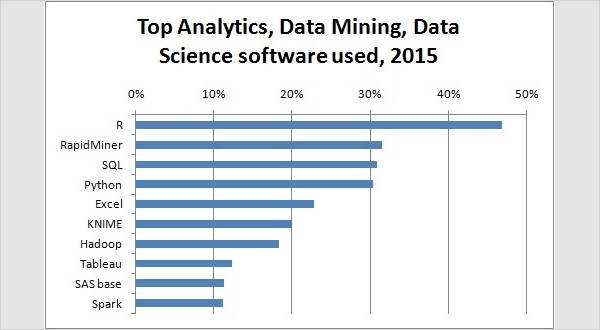 “S CaViS”, “Easy data mining” are some of the popular software for MAC Ops. “Data mining. Remote” is one of the most popular software for Android. This is one of the most versatile and one of the leading data mining software available in the market packed with all the modern analytical technologies to give you the best predictive models without any programming. This is one of the most preferred Data mining software by most of the contemporary business organisations.